In 1930 a young girl was on vacation in the Copper Canyon region in Mexico. There she found an old mine tunnel. There she found two skeletons. She took out both skeletons and hid them underneath a tree, but a flash flood washed away most of the bones. She managed to rescue both skulls. She took them back home, in El Paso, Texas, where she kept the skulls in a cardboard box for a the rest of her life. That girl never gave the name or exact location of the village she had been visiting, or any specific detail on the location of the mine tunnel. She died in 1990. In 1998, the skulls were handed over to Ray and Melanie Young of El Paso. Melanie was a neonatal nurse and physical therapist who understood that one of the skulls was very unusual. It looked deformed but not like anything she had ever seen. She contacted Lloyd Pye, who was researching alternative knowledge and interested in bigfoot and other hominids, to see if he could help her to research this strange skull. She ended up giving the skulls to him. 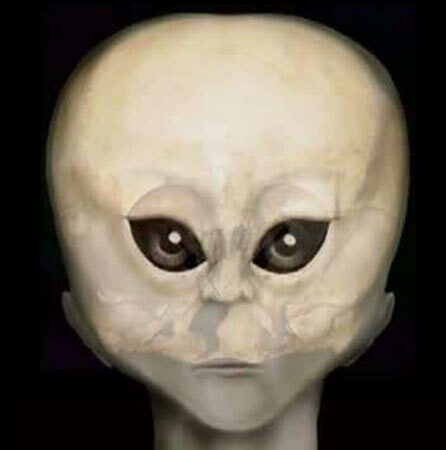 originally Lloyd Pye thought that the strange skull might be the skull of a young child alien being, and thus it was named the Starchild skull. Now we know that it is actually the skull of at east a late teenage if not an adult being. Although being of an (early) adult age (if not older) is was only about 5 foot tall. Lloyd Pye had done extensive testing on the skull. It is definitely not a human skull, but of a different humanoid species. Carbon dating revealed that the skull was 900 years old. 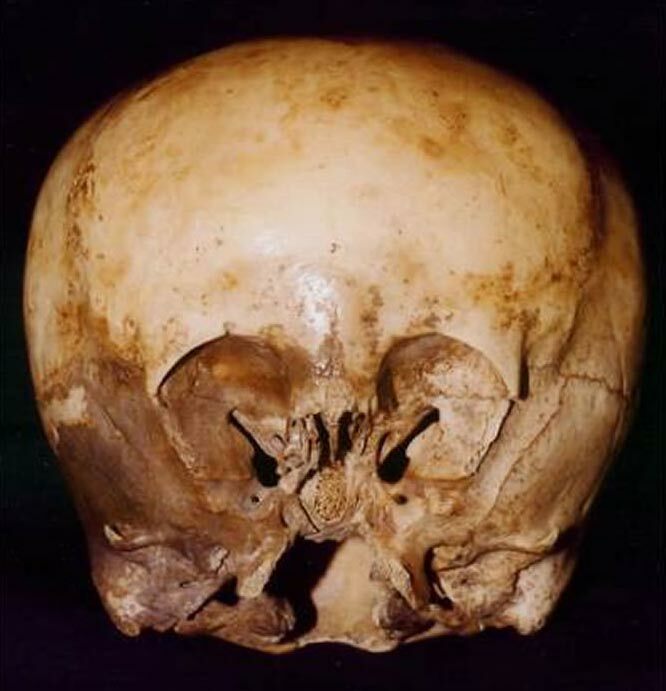 The following is a summary of the most striking features of the Starchild skull that differ from those of a human. You can find more in depth information about all those features if you follow the links at the end of this page. * The skull bone contains microscopic fibers. These fibers have never been found in any skull bone that has ever been studied. Its composition is unknown. * It contains also a red residue not seen in human skulls, and its purpose is not known. * The skull weighs half as much a similar human skull. Its size is that of a 12 year old human child, but the worn teeth show that it was at least a young adult. * The skull bone is 2/3 as thin as a human skull, but it is twice as strong. * Its lower face is much smaller than that of a human. * Humans have brow ridges which the eyelids go into; all primates have brow ridges. The Starchild skull has no brow ridges. Maybe it did not have eyelids. * The eye sockets are totally different. Their shape is different, they are thinner, and the holes were the optic nerves go into are in a different location. The eye sockets are only 0.7″ deep. Human eye sockets are 2″ deep. It must have had very flat eye balls. * The roof of the mouth is flat in contrast to that of a human which is arched. * Its chewing muscles were half the size of those of a human. * The ears are much lower. * The inner ear is 1/3 larger than that of a human. It probably was not hearing low sounds, and more of the higher frequencies. It might also have had a better balance. * Casts from the interior of the skull show that the shape of its brain is different from a the shape of a human brain. * Its neck muscles were half the size of that of a human, but they are holding up a bigger head. * It has no external occipital protuberance. This is the know at the back of the head where all the neck muscles are attached. * It also has no internal occipital protuberance. This holds up the brain, which is bigger with the Starchild skull. * It’s brain capacity is 1600cc. A normal adult human has 1400 cc. A 200 cc difference denotes a totally new species. *The back of the head is wide and flat. this is a natural feature and not the result of cradle boarding. * There is a crease in the front of the skull that is not found in humans. * It has two rows of teeth, and they were worn from eating, which also points to at least an early adult age of the being. * It has no frontal sinuses. Frontal sinuses give us the nasal tone when speaking. No human has ever been found that did not have frontal sinuses. * Chemical analysis of the bone revealed a very high content of aluminum. If this was the result of aluminum contamination in the body, then this would be lethal to a human. The carbon and oxygen level in the skull was higher than in a human skull. * DNA was extracted and partially analyzed. Humans have a maximum of 120 variations (mutations). A Neanderthal had 200 more variations in their base pairs (base pairs are the building blocks of DNA). The Starchild being had 800 to 1000 variations. No doubt that this being was a totally different species. * The FoxP2Gene was examined. this gene allows us to speak. In humans there are no variations to this gene at all. The FoxP2Gene in the Starchild skull has 56 different variations, what also points to a totally different species. Comparison of the Starchild Skull (left) with a human skull (right). Click on picture to bring up a larger size for the Starchild Skull. The Starchild Skull, PDF text, more in depth, scientific information, but presently in a clear way for the average person.